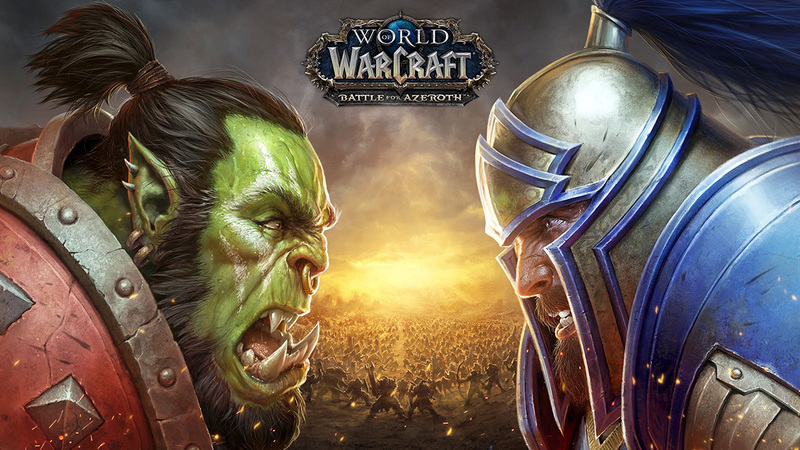 World of Warcraft version 8.0.1 patch notes: the Battle For Azeroth pre-patch is here – AiPT! New character customization options, events in Teldrassil and Lordaeron, new talents, and a lot more are coming tomorrow. Even as Azeroth’s wounds are tended, the shattered trust between the Alliance and Horde now proves hardest to mend. Amidst this age-old conflict, join your allies and champion your faction’s cause. Beginning the week of July 24 and continuing for three weeks leading to the launch of Battle for Azeroth on August 14, experience the escalation of all-out war in Teldrassil, and later Lordaeron. A new chapter of the relentless conflict at the heart of the Warcraft saga is unfolding, and it’s time for you to take your place on the front lines! All of these new options are available at Barber Shops throughout Azeroth, and you can now alter your character’s skin color while you’re there. The PvP Honor and Prestige system has been updated. Your PvP progress in Legion has been converted into account-wide Honor levels, which you’ll continue to earn through PvP. All class specializations’ PvP Talents have been revamped. Hit default hotkey ‘N’ to get a look at your PvP Talents, and default hotkey ‘H’ to see the new PvP system. All PvP Talents you’ve chosen will be available to use anywhere PvP can occur. You’ll gain an additional bonus to experience while leveling up. War Mode can be toggled on or off beginning at level 20 by visiting either Orgrimmar or Stormwind and setting your preference in the Talent pane (default hotkey ‘N’). Beware! Once you venture out in War Mode, all zones will become contested, including zones such as Northshire Abbey. You can now create and join cross-realm social groups in World of Warcraft. Communities make it easier for you to find and play alongside adventurers who share common interests. Hit default hotkey ‘J’ to get started. Now, when you enter an instance at 10 levels or more above the maximum level of the content, Legacy Loot rules will be automatically enabled. Under Legacy Loot rules, drops will include a chance for all items that would drop for a full party or raid at the instance’s level. Sargeras’ cruel, final blow dramatically impacted both Azeroth and all of its denizens. The power of every Artifact weapon has now been depleted. Some powers from Artifacts have now been incorporated into their specializations. Your characters that are just getting started in Legion content will still seek out and acquire Artifacts. Blood Elves’ Arcane Torrent now removes 1 beneficial effect from all nearby enemies and restores 3% of your mana (previously silenced nearby enemies and interrupted non-player characters). Death’s Advance – Grants you increased movement speed and resistance to forced movement effects, knockbacks, and slows. Hemostasis – Each enemy hit by Blood Boil increases the damage and healing done by your next Death Strike. Frostwyrm’s Fury – Summon a frostwyrm who breaths on all enemies in a large area, dealing massive Frost damage. Obliteration – While Pillar of Frost is active, Frost Strike, Glacial Advance, and Howling Blast always grant Killing Machine and have a chance to generate a Rune. Army of the Dead and Raise Dead now have shorter cooldowns. Apocalypse – Brings doom upon the enemy, dealing damage and bursting Festering Wounds on the target. Summons an Army of the Dead ghoul for each burst Festering Wound. Grip of the Dead – Defile/Death and Decay reduces the movement speed of enemies within its area. Demon Hunters have a new ability, Consume Magic – Consume a beneficial Magic effect from an enemy, removing it and granting you Fury or Pain. The spell previously named Consume Magic is now Disrupt. Demon Hunters now have Chaos Brand – Your Chaos damage (Havoc) or Fire damage (Vengeance) brands the target, increasing the magic damage the enemy takes from you and other players by 5%. Chaos Strike now has a consistent chance to refund Fury, instead of relying on critical strikes. Immolation Aura – Engulf yourself in flames, dealing fire damage to enemies and generating Fury. Gluttony – Consuming a Soul Fragment has as chance to activate Metamorphosis. Druids now have Soothe – Soothes the target, dispelling all enrage effects. Solar Wrath now has a chance to grant Lunar Empowerment, and Lunar Strike has a chance to grant Solar Empowerment. New Moon – Deals damage to the target, generates Astral Power, and transforms into Half Moon and Full Moon. Twin Moons – Moonfire deals increased damage and also hits another nearby enemy. Feral Frenzy – Unleash a furious Frenzy, clawing your target multiple times and causing a Bleed. Awards combo points. Tiger Dash – Activates Cat Form and greatly increases movement speed, reducing gradually. In Bear Form, Druids now generate Rage in the same way as Warriors, with Rage generated from both melee attacks dealt and melee attacks taken. Photosynthesis – While your Lifebloom is on yourself, your periodic heals heal faster. While your Lifebloom is on an ally, your periodic heals on them have a chance to cause it to bloom. All Hunters now have Disengage as a baseline spell. Animal Companion – Your Call Pet additionally summons the first pet from your stable as a second companion to fight by your side. Killer Instinct – Kill Command deals increased damage against enemies below 35% health. Aimed Shot – A powerful shot that deals increased damage the first time it hits an enemy. Costs Focus. Rapid Fire – Fires a stream of shots at your target while moving. Generates Focus. Arcane Shot – A quick shot that deals Arcane damage. Costs Focus. Steady Shot – A steady shot that can be used while moving. Generates Focus. Raptor Strike – A vicious slash dealing heavy Physical damage. Costs Focus. Kill Command – Give the command to kill, causing your pet to savagely attack your enemy. Has a chance to immediately reset its cooldown. Generates Focus. Serpent Sting – Fire a poison-tipped arrow at an enemy, dealing Nature damage over time. Costs Focus. Chakrams – Throw a pair of chakrams at your target, slicing all enemies in the chakrams’ path, then returning to you, damaging enemies again. Mages again have Arcane Intellect – increasing allies’ Intellect by 10%. Mages now have Remove Curse – Removes all Curses from a friendly target. Arcane Missiles can now be launched at any time, with a Clearcasting proc sometimes making them free and fire faster. Amplification – When Clearcast, Arcane Missiles fires 1 additional missile. Pryoclasm – Consuming Hot Streak has a chance to make your next non-instant Pyroblast deal massive additional damage. Searing Touch – Scorch deals increased damage and is a guaranteed critical strike when the target is below 30% health. Chain Reaction – Your Ice Lances against frozen targets increase the damage of your subsequent Ice Lances. Freezing Rain – Frozen Orb makes Blizzard instant cast and increases its damage. All specs now have Leg Sweep baseline – Knocks down all nearby enemies and stuns them. Soothing Mist is once again a manually-cast channeled heal. While channeling Soothing Mist, Vivify and Enveloping Mist may be cast instantly on the target. Vivify now heals all targets that have Renewing Mist on them. Rising Mist – Rising Sun Kick heals all allies with your Renewing Mist, Enveloping Mist, or Essence Font, and extends those effects. Avenging Crusader – An ability with a significant cooldown that causes your attacks to heal injured allies, increases your Crusader Strike, Judgment, and auto-attack damage, and speeds up the cooldowns of Crusader Strike and Judgment. Awakening – Light of Dawn has a chance to grant you Avenging Wrath for several seconds. Redoubt – Avenger’s Shield bounces to an additional target and increases your Block. Unbreakable Spirit – Reduces the cooldown of your Divine Shield, Shield of Vengeance, and Lay on Hands. Selfless Healer – Your Holy Power spending abilities reduce the cast time and mana cost of your next Flash of Light, and increase its healing done. Wake of Ashes – Lash out at your enemies, dealing great damage to all enemies in front of you and reducing their movement. Demon and Undead enemies are also stunned. Generates 5 Holy Power. Priests again have Power Word: Fortitude – Increases the Stamina of all raid and party members by 10% for 1 hour. Discipline Priests now know Desperate Prayer and Holy Nova. Contrition – When you heal with Penance, everyone with your Atonement is healed. Renew now reduces the cooldown of Holy Word: Sanctify. Cosmic Ripple – When Holy Word: Serenity or Holy Word: Sanctify finish their cooldown, you emit a burst of light that heals up to 5 injured targets. Holy Word: Salvation – Heals all nearby allies, and applied Renew and 2 stacks of Prayer of Mending to each of them. Cooldown reduced each time you cast Holy Word: Serenity or Holy Word: Sanctify. Mind Sear is again an active ability, causing damage to all enemies near the target, and generating Insanity. Shadow Priests now know Leap of Faith. Dark Void – Unleashes an explosion of dark energy around the target, dealing damage and applying Shadow Word: Pain to nearby enemies. Generates 30 Insanity. Tremor Totem and Earth Elemental are again available to all specs. Stormkeeper – Charge yourself with lightning, causing your next 2 Lightning Bolts or Chain Lightnings to be instant and trigger an Elemental Overload on every target. Totem Mastery – Summons four totems that increase your combat capabilities: Resonance Totem, Storm Totem, Ember Totem, and Tailwind Totem. Earth Shield – Protects the target with an earthen shield, increasing your healing on them and healing them when they take damage. All specs now know Shadowfury – Stuns all nearby enemies. Affliction Warlocks now know Summon Darkglare – A Darkglare from the Twisting Nether that extends your damage-over-time effects on all enemies, blasts its target for Shadow damage, and is empowered by every damage-over-time effect you have active on any target. Creeping Death – Your Agony, Corruption, Siphon Life, and Unstable Affliction deal their full damage 15% faster. Vile Taint – Unleashes an explosion at the target location, dealing damage over time to all nearby enemies and reducing their movement speed. Demonology Warlocks now know Summon Demonic Tyrant – A Demonic Tyrant that increases the duration of all of your current demons by 15 seconds while damaging your target. Grimoire of Supremacy – While you have an Infernal active, each Soul Shard spent increases the damage of Chaos Bolt by 8%. Dark Soul: Instability – Infuses your soul with unstable power, increasing your critical strike chance by 30% for 20 seconds. Warriors again have Battle Shout – Increases the Attack Power of all allies by 10% for 1 hour. Overpower is now baseline – Overpower the enemy, dealing Physical damage and increasing the damage of your next Mortal Strike or Execute. Sweeping Strikes is now baseline – For 12 seconds, your single-target damaging abilities hit 1 additional nearby target for 75% damage. Tactician affects Overpower instead of Colossus Smash – Spending Rage as a chance to reset the cooldown of Overpower. Colossus Smash is now a major cooldown – Smash the enemy’s armor, dealing heavy Physical damage and increasing damage you deal to them. Mastery: Deep Wounds – Striking an enemy with Mortal Strike, Execute, or Bladestorm inflicts Deep Wounds, dealing heavy Bleed damage over time. Sudden Death – Your attacks have a chance to make your next Execute cost no Rage and be usable on any target regardless of their health. Warbreaker – Replaces Colossus Smash. Smash the ground and shatter the armor of all nearby enemies, increasing damage you deal to them. Battle Cry is now Recklessness – Go berserk, increasing all Rage generation by 100% and granting your abilities increased critical strike chance. Bloodthirst now has a consistent chance to Enrage you, instead of relying on critical strikes. Raging Blow now has 2 charges, has a chance to immediately reset its own cooldown, and no longer requires Enrage. Whirlwind now generates Rage per target hit. Furious Slash is now a talent, and the effects of the Frenzy talent have been combined with it. Meat Cleaver – Whirlwind has a chance to Enrage you and generates additional Rage per target hit. Siegebreaker – Break the enemy’s defenses, dealing physical damage and increasing your damage done to the target. Generates Rage. Bolster – Last Stand’s cooldown is reduced, and it causes you to block all melee attacks. Menace – Intimidating Shout disorients enemies for an additional 4 seconds, and it causes all enemies to cower in fear instead of fleeing.